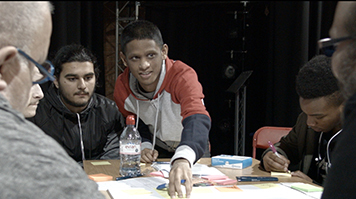 London South Bank University (LSBU) brought together high school, college and incoming university students to spend a day discussing and developing their ideal “BBC of the future” with a number of industry experts from the BBC and equivalents from Canada and Austria. LSBU’s Head of Creative Technologies, Professor Lizzie Jackson, said young people have completely different news consumption habits to previous generations, and consulting them was key to ensuring public service media could adapt. “Young people obtain much of their news via social media, which is an indication that swift adaptation is necessary for public service media to remain central in the future media landscape,” she said. The ideas were presented as part of an expert panel discussion, which is part of a wider event series called Think | Make | Show sponsored by LSBU’s new Institute for the Creative and Digital Economy (CDEI). The event was jointly hosted by LSBU and the University of Warsaw as part of a three-year study on the evolution of public service media in Europe and North America funded by the Polish Science Centre (NCN). Learn more about the School of Arts and Creative Industries at LSBU.